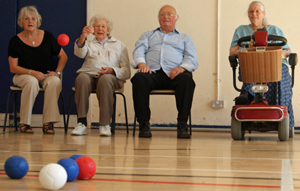 Boccia is a fun a friendly game that is accessible to anyone. Teams of 5 are seated and the aim of the game is to get their Red balls closer to the White ‘jack’ than the opposition's Blue balls. A game of skill and precision that can be picked up quickly and played by any ability. We are looking for new teams to join our league! Please call Healthy Lifestyles Team on 01273 294589 for details. Patching Lodge, Park St, Kemp Town, BN2 0AQ. Buses 1, 1A,2, 7, 14C, 14B, 23 and 52.